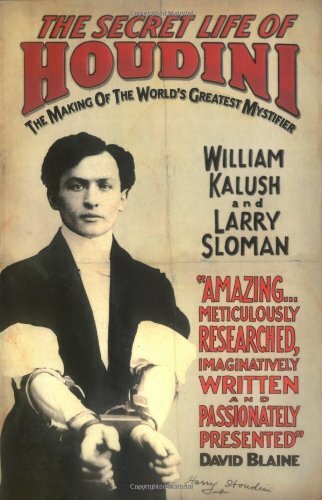 On the 24th of October 1926, the legendary U.S. magician Harry Houdini (Hungarian-Jewish born Erik Weisz, 1874 – 1926) performed his last show at the Garrick Theatre in Detroit, Michigan. A week later he laid dead in a local hospital. The reasons for his passing away have been subject to numerous urban myths, yet the truth could not be more ordinary and gratuitous. Houdini was the first superstar escapist known for stunts involving underwater straightjackets, beer barrels, chains, ropes, handcuffs, being buried alive, prison breaks, even escaping from the belly of a beached whale! Throughout his life, he had constantly invited his audiences to find him insurmountable challenges and so, unsurprisingly, his death mystified the public. In Houdini!!! : The Career of Ehrich Weiss (1997), Kenneth Silverman points out the misconception that Houdini died in the famed “Chinese Water Tank trick”, or shortly after being freed from the device. Houdini invented this stunt in which his feet were locked in stocks, he was suspended in mid-air from his ankles with a restraint brace and lowered into a glass tank full of water after which the restraint was locked to the top of the cell and he had to find a way to break out. The myth of his perishing in the water torture cell was promoted by a couple of Hollywood movies, one of which was the 1953 semi-biopic featuring Tony Curtis. Another speculation was that, because he happened to pass away on the 31st of October, Halloween day, and he had spent most of his life debunking the occult aspirations of the spiritualists, mind readers, fortune tellers and other such charlatans, an organisation of this ilk might have poisoned him. The basis for this conspiracy theory was presumably that he threatened the livelihoods of the pro-spiritualists by unmasking the tricks of their craft. Houdini’s sceptisim actually caused the rift in his unlikely friendship with Sherlock Holmes’ creator and self-formed spiritualist Sir Arthur Conan Doyle. The latter was certain that Houdini possessed the ‘divine’ gift of dematerialisation, even though the magician consistently denied any such occult capabilities. Learn something new everyday. Thanks from this. i have seen someone suffering from peritonitis, and it was very very painful. thankfully modern medicine saved her life. A bit of a Whodunnit on Houdini. Enjoy!